- Publisher Think you know everything there is to know about Jesus? Think again. In 70 short, engaging, and unpredictable daily readings, learn more about the life and teachings of Jesus Christ. Written by students, for students, every devotion tackles an issue relevant to your life. Ask yourself: What was Jesus really like? Why did God send Him to the Cross? How can we be more like Him? Get to know Christ and make Him known. This is the only devotional featuring Bible text from the best-selling The Message//Remix . Start your day off with 7 minutes to grow closer to Christ. Grab your girlfriends and hold on for the ride of your life as you discover what the Bible has to say about faith, identity, and much more. This character Bible study covers topics important to women, including forgiveness, rest, worship, and spiritual transformation. Leader's guide included with discussion questions. 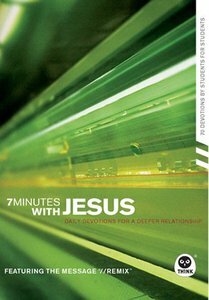 About "7 Minute With Jesus: Devotions For a Deepers Relationship"
Think you know everything there is to know about Jesus? Think again. In 70 short, engaging, and unpredictable daily readings, learn more about the life and teachings of Jesus Christ. Written by students, for students, every devotion tackles an issue relevant to your life. Ask yourself: What was Jesus really like? Why did God send Him to the Cross? How can we be more like Him? Get to know Christ and make Him known. This is the only devotional featuring Bible text from the best-selling The Message//Remix . Start your day off with 7 minutes to grow closer to Christ.